the modem must provide support for Fax Class 1 or 1.0 commands. In addition, the other party must have hardware or software installed that allows the sending and receiving of color faxes. Color fax messages can be generated by printing to the VENTAFAX printer. This is done by selecting the appropriate printer settings or via the Message Manager. If the receiving fax machine does not have color fax support, a color fax will be automatically converted into a black-and-white version at the time of transmission. Conversion will be performed using an algorithm corresponding to the 200*200 dpi and Photographic halftones settings combination for black-and-white printing on the VENTAFAX printer. The system requirements remain the same as for transmission of color faxes. Thus, if the original document contains no color fragments, it makes no sense to generate it as a color fax. The volume of data transmitted through a telephone line does not depend directly on the size of the generated file. During transmission the data undergoes additional compression. The degree of compression, as well as the resulting quality, is determined by the setting Fax quality during transmission, accessible under the tab Fax - Format - Color faxes. 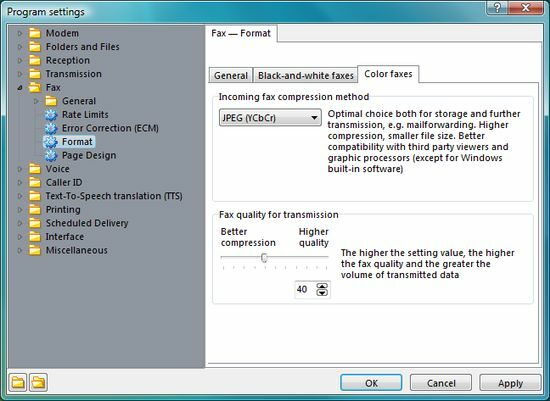 When generating a fax document it is recommended you use LZW compression (for color faxes this is set as the default in the printer settings). It is true that the file size can end up being several times greater than with JPEG compression. However, as mentioned previously, this will not affect the volume of data transmitted. You might ask: why use LZW compression if it takes up more disk space? The answer is simple. If a recipient's fax machine is unable to receive color faxes, the program has to convert the fax document into black-and-white format. And a black-and-white fax message that has been converted from a color fax with JPEG compression of average or minimal quality could very well display some defects. For example, it might have unsightly extra dots around black symbols. So it is better to generate fax documents using LZW compression, to ensure there is no reduction in quality. Color faxes are always sent and received with ECM (Error Correction Mode) enabled. You can use color on cover pages. If a color cover page is attached to a black-and-white fax, it is converted into a black-and-white page.